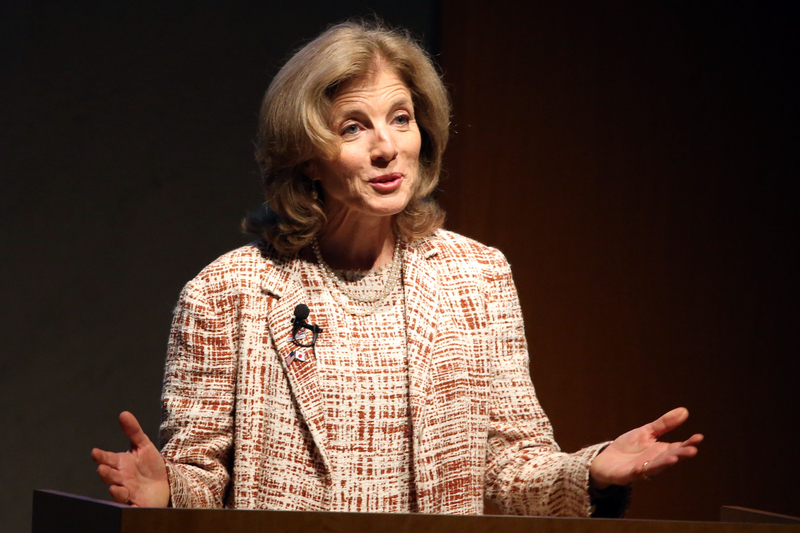 A State Department report released Tuesday revealed that Ambassador Caroline Kennedy has used a personal email account to send and receive official emails in her role as head of the American embassy in Tokyo. Kennedy and members of her staff allegedly used personal email addresses to correspond in official capacities — in some cases, where "Sensitive but Unclassified" material was involved. If you're thinking this sounds familiar, you'd be right. For months, Hillary Clinton has been at the center of "Emailgate" for her use of a private email account during her tenure at Secretary of State. The difference? There are many, but perhaps most important at present is the fact that Kennedy isn't running for president. Clinton, on the other hand, is running for president, and the saga that is her email scandal certainly hasn't helped at the polls. Will this newest development help or hurt Clinton? It could go either way. The State Department's report covered a comprehensive investigation into many aspects of the embassy's operations, including potential cost savings, hiring practices, and communications. When it comes to email usage, the Office of the Inspector General found that "senior embassy staff including the Ambassador" used personal email accounts for official correspondence. According to the report, government employees "generally should not use" private email accounts because they tend to lack the same level of security that government accounts have. For her part, Clinton has been found to have used solely a personal email account as Secretary of State — she had her own email server. She has handed over more than 55,000 pages of these emails to the State Department, but an unknown number of emails were allegedly lost when Clinton wiped the server, which is now in the federal government's possession. Clinton's own email scandal has hardly helped her on the campaign trail. Although she still leads the Democratic field in many nationwide polls, she has lost ground in several key states. In New Hampshire, for instance, Clinton now trails surging candidate Bernie Sanders. It's not possible to say that the email scandal caused Clinton's losses in the polls, but it has surely made her look untrustworthy to many voters. According to a recent Quinnipiac University poll, only 37 percent of Americans said they found Clinton to be honest and trustworthy. What's more, a Suffolk University poll of more than 500 Iowa voters found that the top two reasons people give for not favoring Clinton are that she's untrustworthy and her email scandal. Now that Kennedy has a similar scandal, it's likely that things could go one of three ways: Americans could find personal email use to be a trend and fault Clinton less for using her own server; they could hold Clinton accountable for setting a bad example for the State Department; or they could just not care either way. What could be important here is that the State Department has maintained that Kennedy did not break any rules. She routinely used her government email account and did not discuss classified information from her personal account. The State Department's policy only says that officials should limit their use of personal email accounts, not that they can never use them. Could this small caveat improve perceptions of Clinton's private email usage? Probably not considering Clinton used only a private email server. Ultimately, it's still too early to tell how Kennedy's personal email use will affect Clinton's campaign, if at all. Still though, having the phrase "personal email account" buzzing around the Internet probably won't be sending any undecided voters Clinton's way.